You don’t know what simit is? Well, google it! Basically, Turkey wants to be one of the top 5 touristic destinations by 2023. Given the fact that the country currently ranks 6th, it is not an unrealistic objective. Turkey has also been spending considerable amounts of money on various advertising campaigns that do not necessarily mean anything for target audiences (-who can forget the beautiful “Unlimited Turkey” campaign?). Turkey indeed solely wants to increase the number of tourists coming into the country, and place/nation branding is not the only way to attract tourists. A well-run marketing campaign, together with clever use of advertising, is likely to attract more people to the country – though even then, I am not sure whether the “Home of” campaign is a good advertising campaign. 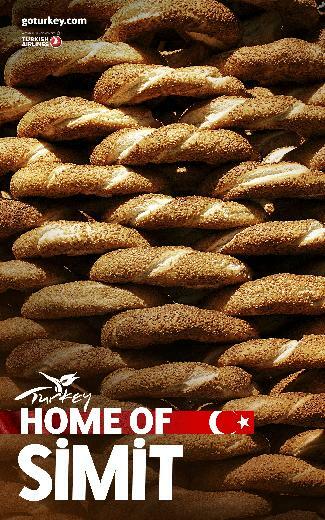 Seriously, Home of Simit? Simit is indeed a great conversation starter on Turkey but is it a good selling point? Does your audience have any familiarity with it? International marketing of “soft” values, services, and experiences is a little bit more complicated than advertising. You are expected to sell an abstract value, an idea to the general public. As I (and many others) have argued elsewhere, the job is not necessarily about the logo or messages but is about how you get to create them and how people interact with your logos/messages. I think the copywriters just ran out of ideas here. Turkey: Home of Turkey! No matter how good your ad agency is (and I don’t think you can get anybody better than Mr. Yucel and his team), a nation brand cannot be created by an advertising mindset. Marketing, advertising, branding, and place/nation branding are different fields of practice and study. A nation brand cannot be created with solely tourism in mind. There is no need for a brand if the country has short term quantifiable outcome expectations. of course you also know this reality very well.But you, again prefer to insult Turkey as usual. It would be very helpful to get the Communication Plan which included motivations an details of this campaign. I think the result is rather far from the effect they wanted to get.